To paraphrase Winston Churchill, I have been a vocal advocate of electronic signatures for a long time; and I will not now unsay a word of my advocacy. Most statutes, rules and orders are silent or very broad as to HOW an electronic signature must be appended and represented on court documents; and many, if not all, enabling statutes, rules and orders authorizing the use of electronic signatures for courts allow for use of ” /s/ ” followed by the typed name of the signatory. For some very good reasons, many of which I have previously noted, this approach offers flexibility while still providing the requisite level of authentication. That said, I think it’s important to note two aspects of signatures that are definite plusses when they can be provided with no loss of efficiency. First, while legally a ” /s/ ” and typed name may suffice, there is something more emotionally compelling about a signature that looks like a signature. Of course, “looks like a signature” is somewhat subjective. My signature, for example, is notoriously illegible. But it IS distinctive. There’s a reason that all U.S. paper currency bears the signature of the Secretary of the Treasury instead of just the printed name. Some documents, particularly court documents, have solemn effects. Signatures that are clearly hand-drawn contribute to the solemnity of the document. Second, and related to the first, is the question of permanent inextricability. If a mason leaves a plaque beside his work, the work will be identified as his as long as the plaque remains in place. But if he writes his signature into the cement, as long as the cement is there, so is the attribution. A lad can post a note on a tree declaring his affections, but carving a pair of initials inside a heart into the tree will be seen as a much more enduring statement. 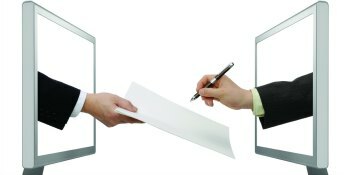 In the same vein, there is a definite benefit to not only electronically signing a document, but permanently and inextricably binding the hand-drawn signature to the document itself. That is, rather than simply overlaying an image of a signature, which could later be removed or substituted, “burning” the hand-drawn signature into the document itself. That way, as your mother used to tell you about tattoos, it will be there forever. It’s an easy trap to fall into to focus strictly on the mechanistic and legalistic requirements for documents when implementing paper on demand. Indeed, in the efforts to craft the most efficient technical solutions, many implementers — with the best of intent — overlook the emotional and psychological factors that have been implicitly and explicitly utilized to assure and reinforce the impact of court documents. The very foundation of the legal system rests on the beliefs of the public over which it asserts authority. For that reason, it is both legitimate and valuable to continue to utilize hand-drawn signatures, permanently attached to court documents, even as the court moves to a paper on demand module. TrueSign®, from ImageSoft, provides the capability to burn hand-drawn signature images into documents. Next postWho Is That Lurking in the Shadows?